TWO peninsula community volunteers were honoured for their selfless efforts at last week’s Delys Sargeant Age-Friendly Awards. John Drysdale, a Somerville Community House and Peninsula North Men’s Shed committee member, was named Elder of the Year, while RPPFM’s Dennis Gist was named Senior Achiever of the Year. 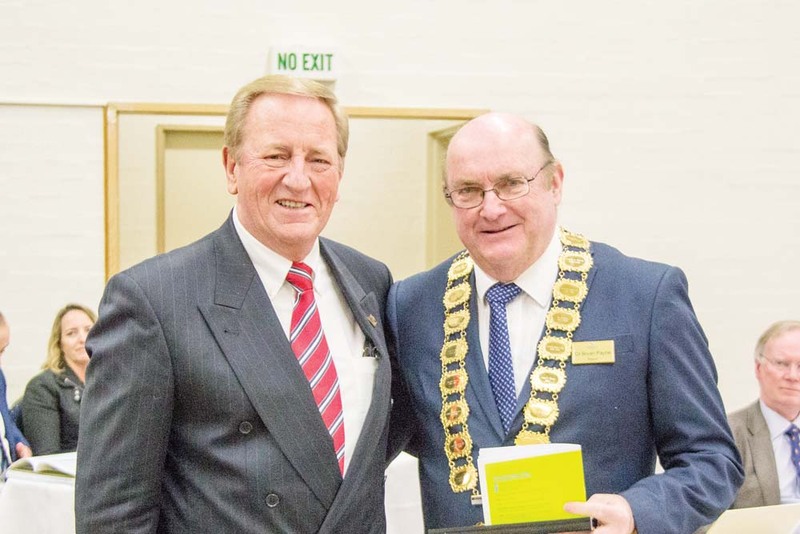 Mornington Peninsula mayor Cr Bryan Payne presented the awards at the Mt Eliza Community Centre, Tuesday 28 August. They honour the men’s “significant contributions to the community and the Mornington Peninsula by a person 50-plus years of age”. Other awards were made to individuals, clubs, services or businesses that contribute to building a stronger local community for older people who live, work or play on the Mornington Peninsula. Mr Drysdale was described as being integral to the establishment and development of the men’s shed movement on the Mornington Peninsula. The sheds promote fellowship, inclusiveness and self-respect among their mainly elderly members. The Peninsula North Men’s Shed, at Baxter, also won an award on the night. 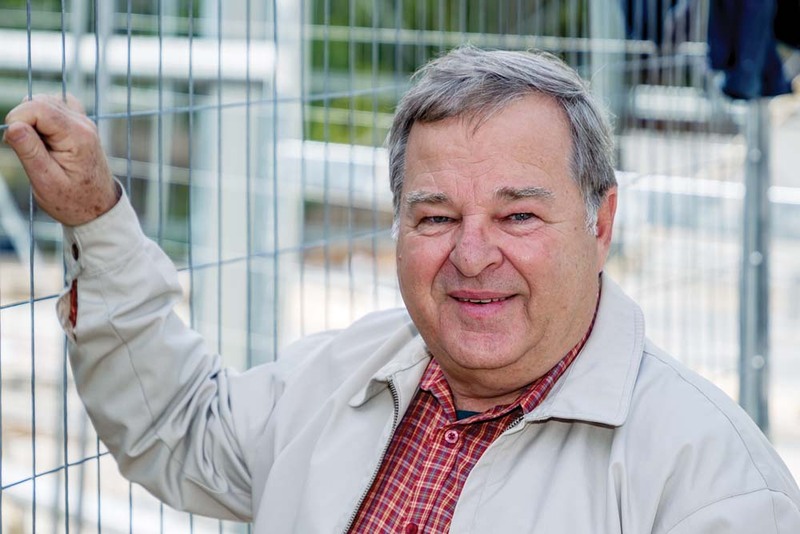 Initially financing a men’s shed on his own property, Mr Drysdale worked for five years to secure sufficient funding and site and plans for a purpose-built shed. He also volunteered his time and expertise to assist in the establishment and revival of other men’s sheds on the peninsula. Mr Drysdale is an executive committee member and field representative of the Victorian’s Men’s Shed Association as well as a valued member of the committee of management of Somerville Community House. Mr Gist’s voice is heard by all sectors of the community as a volunteer presenter on peninsula radio station RPPFM. Four years ago, he introduced the PACE on AIR segment on his weekly show aiming to help shape the peninsula as a place to age well. He hosts a variety of guest speakers who discuss local opportunities and issues impacting older residents, including local intergenerational opportunities. Mr Gist frequently lends his “radio voice” and “em-ceeing” skills to other community causes, such as the Western Port Festival. In his busy retirement, Mr Gist promotes recent history as ambassador of the Victorian Maritime Centre. He aims to raise support for the establishment of a museum at Hastings for the retired submarine HMAS Otama. Cr Payne said the shire was “proud to acknowledge the outstanding contributions [which] ensure older residents have every opportunity to participate in a community that values positive ageing”. “Our winners and finalists represent both volunteers and a wide range of organisations, including community centres, service clubs and charities, support agencies, sports clubs and interest groups across the peninsula. Ms Sargeant (OAM) was the founding chair of the council’s community advisory committee on ageing, Peninsula Advisory Committee for Elders (PACE). She played an integral role in shaping the council’s approach to supporting residents to age well. She was a life member of PACE until her passing in 2017. FORMERLY the Royal District Nursing Service, Bolton Clarke is a not-for-profit business well known to older people on the peninsula for more than 10 years. It provides age-friendly, person centred allied health and nursing services to older residents, their families and carers, and the aged-care workforce. Bolton Clarke values the wisdom of older people, encouraging active participation in the development of their products and services, such as their range of talking books, and conducting presentations on various health issues to local organisations and groups. THE Hastings Police Senior Citizens Register has been run by volunteers since the 2000 and has more than 1000 senior Western Port residents on its database. It aims to promote confident and secure living and to help prevent older residents from being socially isolated. Volunteers on the register talk to their clients about personal and home security and confident living, aiming to give peace of mind to their clients and families. The register organises CFA crews to change clients’ smoke alarm batteries and volunteers provide cheery assistance to clients over the phone, through drivers, home visits, social events and a quarterly newsletter. THE public rose garden in Mornington is managed, maintained and funded by the efforts of volunteers who welcome people of all ages and visitors to the Mornington Peninsula. The garden provides an opportunity for relaxation every day of the year. Its pathways, ramps and facilities accommodate all levels of mobility. Opportunities are provided to many clubs, such as Probus and seniors groups, to attend a walk-and-talk program while enjoying a cup of tea. The Rose Garden has been awarded Garden of Excellence by the World Federation of Rose Societies. IN her first foray into case management and as an older person, Ms Allen began working with SalvoCare at Rosebud three years ago. She is said to work “tirelessly and successfully to house older people who are homeless”. No matter how the person came to be in their position, Ms Allen consistently provides a strengths-based approach to empower positive change and access safe and affordable accommodation. She networks with local organisations to meet the needs of older homeless people and has, at times, travelled to regional Victoria to help her clients establish themselves in new neighbourhoods. PENINSULA North Men’s Shed established this year at Somerville aims to bring men of all ages together in the Baxter, Somerville and Tyabb areas. The sheds reduce social isolation and improve the health and well-being of their members. Men of all ages and from all walks of life and abilities are encouraged to attend and participate, with the overriding spirit of friendliness, inclusiveness and respect. Members can use woodworking and metalworking equipment and are welcome to watch others or have a go themselves. The shed’s 68 members come together to learn new skills, work on a variety of personal or community projects, practice a hobby or go on social outings to places of interest. Peninsula North Men’s Shed has worked on intergenerational projects, such as working with Somerville VCAL students to build a mural wall and viewing deck at the Yamarrala Wetlands, building a mobile chicken coop and working on various projects with home-schooled students. Mornington Peninsula Table Tennis Association – for their ongoing inclusive approach to people of all ages and abilities participating in the fun and friendship opportunities of playing table-tennis at their local club. Mornington Peninsula Post-Polio Support Group – for their long and sustained work in providing polio survivors with support, fellowship and an opportunity to share information about living with symptoms, including producing a widely distributed and light-hearted handbook shedding light on polio’s puzzling late effects.